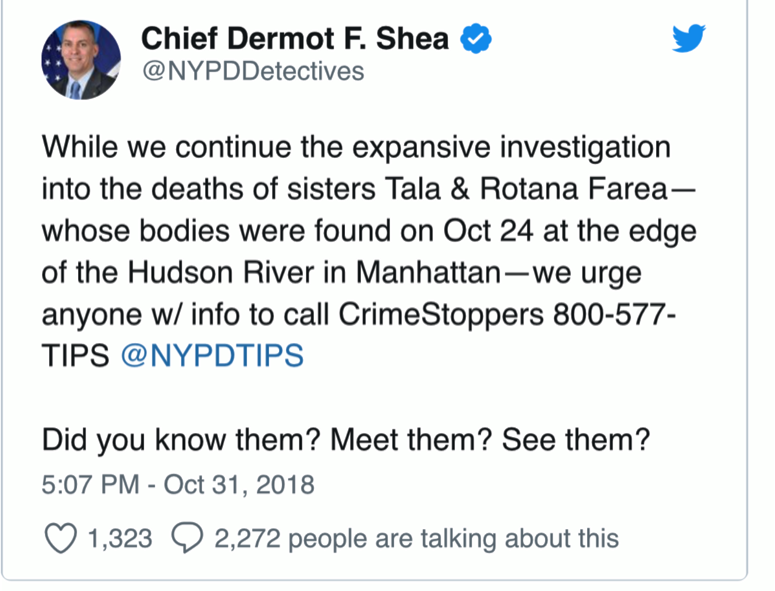 Saudi sisters found dead in the Hudson River. GDN - A gruesome riddle that the New York police has been busy for a week. According to the New York police, the two young Saudi women were handcuffed to each other with tank tape, the two bodies turned to each other and both were clothed. The indignation of the discovery situation can be read worldwide. Whether the two sisters have taken their own lives or a perfidious murder plan was implemented, leaves the police still puzzling. However, some speak more for a murder. It is clear that both Saudi women were still alive when they got into the waters of the Hudson River. 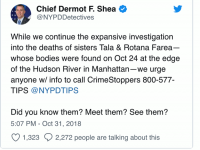 The early-established theory that the sisters had plunged into the river together from the George Washington Bridge, ten kilometers from the site, according to chief investigator Dermot Shea cannot vote. The tape was undamaged and both women have no injuries, as would otherwise have been typical in such a deep fall. Two crucial points let the murder investigators focus the death on a fatal issue that raises several questions. Crucial is the statement of the mother, which gives the investigators a high degree of importance. She told investigators that she had received a call from the Saudi Arabian consulate a day before the bodies of the sisters were found. Her daughters applied for political asylum in the United States of America. The family should leave the United States as soon as possible, the caller has demanded. Why the call and the hurry that Saudi Arabia warns after hearing from the mother? In this context, it raises the question: Is there probably a connection between the asylum applications and the deaths of Tala and Rotana? The New York Police are now examining the family's past. It is clear that in 2015, the two women and their mother from Saudi Arabia to Fairfax (US state of Virginia), had come about 360 kilometers southwest of New York. According to the Daily Mail, the disappearance of the sisters (and their probable death?) could be related to their university career. Rotana had studied at George Mason University from January 2016 to May 2018. It is a university with very close ties to Saudi Arabia (source: New York Policedepartment). It is known that the Saudi Arabian Cultural Foundation donated around 56 million Euros and financed the education of 270 of the 370 Saudi students. However, Rotana did not return to university in August to get her degree in bioengineering. It may be that the woman is worried that the family would have to return to Jeddah in Saudi Arabia after graduating. According to the mother, the sisters did not want to return to their Saudi Arabian homeland. The Saudi Arabian consulate in New York said on Tuesday that a lawyer had been assigned the case. The Embassy of Saudi Arabia in Washington had also "contacted the family and offered help at this difficult time." Investigators are working hard to educate the dead Saudi sisters.